You’d know Michelle Kawpeng to be a dancer from the first time you meet her. Long-limbed, tall and lean, carrying a grace to her that can only have come from years of being onstage. There is no doubt as to what she was born to do. And she’d tell you the same when you ask her. As she watched her peers take on steady, corporate jobs, she felt the pressure to do the same, thinking that was what she should be doing. She thought she had to leave dancing behind forever. But just three weeks in another desk job, she decided to quit the corporate world. This marked the beginning of this dancer’s journey into what she does not think much of as a business, but rather a risk-worthy and passion-fueled venture. Michelle’s road to the dance instruction scene has a strong foundation. She is known as the former head of Ateneo de Manila University’s dance group, creating dance pieces that earned them recognition and numerous awards. After refusing numerous personal dance opportunities because of her work, she realized that as she grew older, those opportunities would dwindle. This is simply a fact in the life of any dancer. She knew she had to strike while the iron was hot. Michelle eventually moved on to teaching contemporary dance at Groove Central studio, and being an instructor for Plana Forma, which is a barre technique combining pilates, yoga and dance. Still, she was continually plagued by the fear that dance was something she would eventually have to let go of. But sometime in 2015, after a grueling day at work, she went through an emotionally draining reflection. All the while, she kept receiving requests to choreograph dances and teach workshops. This made her realize that she must have her own space to practice. Her small bedroom just wasn’t cutting it anymore. Michelle lacked the resources to rent a huge space for a studio, much less for the construction of a building that can house a studio. She was left with no other option but to seek the aid of her family. It started as a request to her father to let her clear at least one room in their house in Mandaluyong, even for just a bit of space. Her mother suggested that she use the basement, though much work and some investment had to be made for setting up the needed wall-to-wall mirrors, wood panel flooring and a bar across a wall. She was able to convince them that it was worth the risk, and sometime later, her studio was born. The dance-teaching scene in the Philippines is a tough one to break into, especially if you’re just starting out. Many dancers have to get into big companies and schools just to be able to teach classes, because renting out a space to do it requires a lot of money. She also trained under the watchful eye of Toni Lopez Gonzalez, who became a second mother to her, and to whom she believes she owes everything. She instilled in Michelle the technique, the passion and the drive not just to dance, but also to teach. Michelle started teaching basic ballet classes last summer to a fair-sized class of children, which she continues during the school year. Every Saturday, she holds contemporary classes for older students. Aside from those, she and a good friend, Vyen Villanueva, have founded their own contemporary dance group that they call REDph. Her beloved studio is definitely never wanting for activity. She proudly declares that her aim is to create a very human environment, one that is honest and motivating. Driving the point that she doesn’t want to be the teacher that is put on a pedestal, she says, “I really teach by example. If I say that conditioning is important and everyone has to do it, all of my students will see me conditioning... Whether we’re doing it together or one-by-one, they’ll really see me working hard on it. 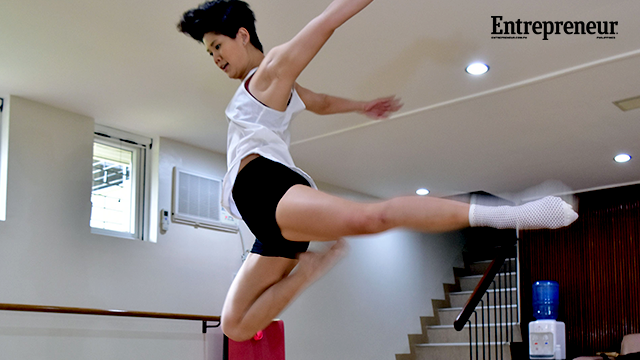 When there’s a step I can’t do, they’ll see me working on it—falling down on the floor, getting hurt, getting injured.” This way, her students see that no move is ever too impossible to do, with hardwork. She’s lucky enough that her studio is part of her own home, and that takes care of any rent worry. But she has to maintain it with earnings from her classes. She also has a system with her team, REDph, where every member pays a fee twice a year. It’s still a growing business, and big earnings are not her top priority at the moment. Together with REDph, Michelle will be staging a contemporary dance concert on November 27 at the AFP Theater. 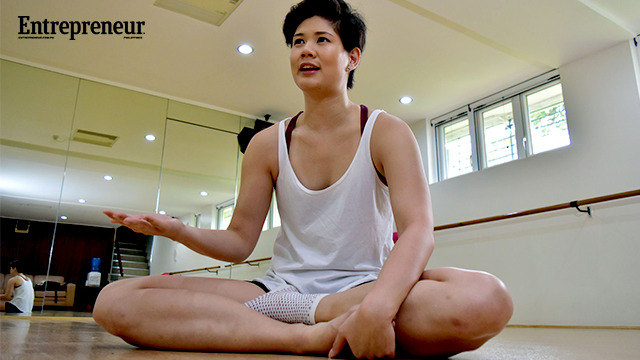 Through this, she hopes to bring her brand of dancing and teaching to the attention of a wider audience, and eventually, a bigger clientele. And hopefully, that can earn her the chance to teach more students and train more dancers. She has many dreams for her studio, very young dreams, but she’s armed with the resolve that with her drive, these dreams will come true in due time. For more information on Michelle Kawpeng's dance studio and REDph, go to facebook.com/RawElementsDance. Patricia C. Verzo works as a freelance journalist and copywriter, and has been part of TravelNow Magazine, among other publications. She is a fictionist currently taking up her Master's Degree in Creative Writing at the University of the Philippines.